This morning was our dreaded home visit of the home study process. This is the third out of three "official" meetings we have for our home study. The first two meetings were in the quiet, calm office environment of our social worker's office. But today...she was required to come to our home to make sure not only were we fit to be parents but our HOUSE was fit to be a child's home. 1. We made sure all safety standards were up-to-code. Fire extinguishers? Check. Able to open all windows? Check. Smoke & Carbon Monoxide Detectors? Check. And for extra measure: items available for child-proofing when the time came? Check. 2. 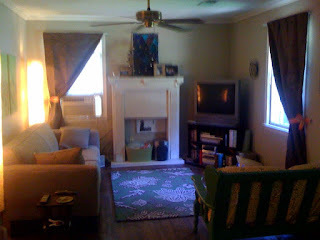 I took my prized Dyson and vacuumed every corner and baseboard in our house. Followed up with a thorough vacuuming and mopping of the floors. 4. We gave the dogs plenty of exercise this morning so they were so tired that all they could do was lay quietly in the corner. 5. 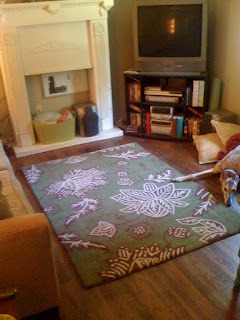 Grand Finale: New rug & curtains that I've been wanting to replace fooorrrreeeevvveeerrr. After my five steps of worry-freedom, I plopped down on the couch last night a happy girl. I was happy about my house and the way it looked. It was clean, safe, and cute. Glad it went well. And your house looks cute! just kidding what if that was all i wrote? GOOD JOB! place looks like it looks great (if that makes sense) . cant wait to see, and I'm glad it went so well. Owens' freakishly long leg. Ha. Your place is all ready, you ought to throw a party. Marimba your neighbors right back. autumnal is TOTALLY a word--and a great one at that. Love your new rug. It is awesome. SO glad things went well today. I, too, am impressed with your preparation! You are going to be one cool momma! I love your space. it is fabo. and you are beyond suitable for a child. ;) I'm so glad it went well!! !